Capital City Diner, closed this past winter, is now up for sale on Ebay, including all of the fixtures, kitchen equipment and various accoutrements. 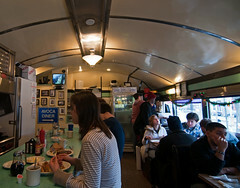 The diner is a Silk Road Diner, built by the Paterson Vehicle Company in 1947, and features five booths, sixteen stools, and could be reconfigured to seat more. The 40′ x 14′ diner also comes with contacts at a reputable diner-moving company (a problem you don’t want to have, believe me), and the bid is currently $20,000.